I love to watch hours of videos on youtube of people painting landscapes, mostly game designers and what not but still, its amazing to see. I'm fairly terrible at it myself but I do love to give it a go every now and then. I wouldn't say this is finished but it will do for now. 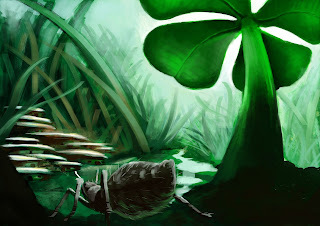 A little society that lives under the grass near a giant lucky four leaf clover, because why not.